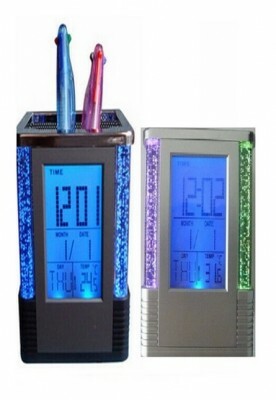 digital light pen holder with music alarm clock. Timer can be set for run and count down. Temperature display can be transferred into Fahrenheit or Centigrade. Single Pen Stand serves 6 Purposes. 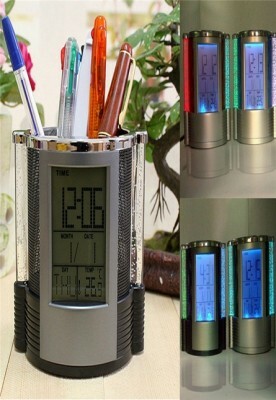 Pen holder color light (backlight). Music alarm clock. Time display (month, date and day, 12/24 hour format transferred). Timer (it can be set for run and count down). Temperature display (Fahrenheit/centigrade transferred). LCD screen powered by 2 x AG13 batteries. Dimensions: 80mmx80mmx115mm. Weight: 175g.